This year’s ‘Race to the Sun’ is notable not for the big-name riders who will be participating, but the lack of them. Well, that’s the story anyway. Although most of the really big shots of the peloton will be racing Tirreno-Adriatico (held at the same time) in Italy this year, there’ll be a few left for Paris-Nice, including Philippe Gilbert, Tejay van Garderen, Tom Boonen, Thomas De Gendt (who won the Nice stage in front of my very hung-over eyes last year), and of course Thomas Voeckler, who never seems to miss a French race. 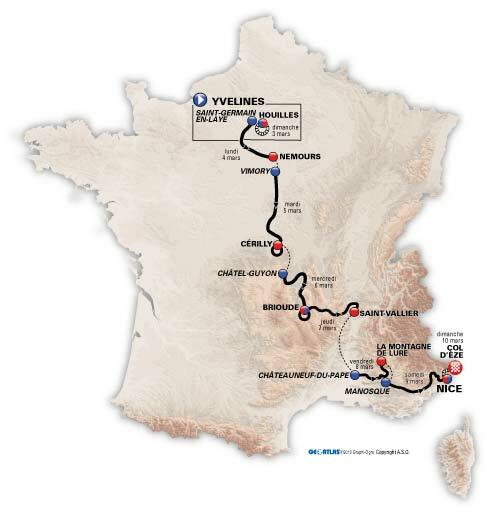 The 8-stage race will have a couple of flat stages before running through the Massif Central, then a final push through the edge of the Southern Alps before landing in Nice. Like last year, the final stage will be an ITT from the center of Nice to the Col d’Eze, high above the Mediterranean. With a little luck Shoko and I will be there again this year, and with a little more luck I won’t be hungover…but it’s my birthday, so no promises. 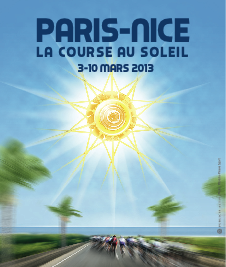 This entry was posted in Cycling and tagged paris-nice 2013 route map. Bookmark the permalink. Oh, nowhere near us this year 😦 It was brilliant seeing it last year, even if it was in the hail and biting wind! A shame it is. They never come by me, but never really far, either.